Aim: To draw up recommendations for the investigation and management of children with a microdeletion of chromosome 22q11. Methods: A retrospective review of case notes from patients with a chromosome 22q11 microdeletion identified by cytogenetics laboratories of the south and west of Britain over a four year period. Results: A total of 210 cases were identified. Age at diagnosis was 0–1 years (34%), 1–4 (17%), 5–17 (35%), and 18 years or more (13%). School age children were less likely to be investigated than infants: echocardiography in school age 86% v in infancy 97%, serum calcium 66% v 89%, renal ultrasound scan 38% v 42%, lymphocyte count 26% v 68%, parental karyotype 78% v 88%. The yield of investigations remained high throughout all age groups with 42% of school age children shown to have hypocalcaemia and 25% abnormal findings on renal ultrasound. Conclusions: 22q11 microdeletion is a multisystem disorder requiring a set of core investigations at diagnosis. We recommend an echocardiogram, renal ultrasound scan, lymphocyte count and function, serum calcium, and parental karyotype as a minimum. Genetic counselling and community paediatric input is helpful for most families. The syndrome of chromosome 22q11 microdeletion includes a number of congenital malformations, which are recognised by paediatric cardiologists and cleft surgeons. Increasingly, milder manifestations are being recognised by general and community paediatricians in the school aged child. Despite a wide phenotype there are certain common aspects, namely congenital heart disease, cleft palate or velopharyngeal insufficiency, hypocalcaemia, renal anomalies, recurrent coughs and colds, learning difficulties, speech delay, and behaviour problems. We decided to systematically review the medical investigation of children of all ages with this syndrome. Our aim was to draw up recommendations to improve and standardise the investigation and management of this group of children. A total of 210 patients with a chromosome 22q11 microdeletion as detected by fluorescent in situ hybridisation by the regional cytogenetics laboratories were included in the study. Standardised retrospective case note review detailed findings in seven areas: cardiac, renal, metabolic, immunological, genetic, palatal, and developmental. Age at diagnosis was 0–1 years (34%), 1–4 (17%), 5–17 (35%), and 18 years or more (13%). School age children were less likely to be investigated than infants: echocardiography 86% v 97%, serum calcium 66% v 89%, renal ultrasound scan 38% v 42%, lymphocyte count 26% v 68%, and parental karyotype 78% v 88%. The yield of investigations remained high throughout all age groups, with 42% of those diagnosed at school age found to have hypocalcaemia and 25% abnormal findings on renal ultrasound (see table 1). Forty two per cent of those with documented hypocalcaemia had experienced seizures compared to 11% of those with no evidence of hypocalaemia. The finding of hypocalcaemia in this group appears to be a significant risk factor for developing seizures (χ2 = 230, p < 0.001). Figure 1 shows the developmental aspects of this condition. Eighty per cent of the school age group had learning difficulties—49% with mild difficulties, 23% moderate, and 8% severe learning difficulties as recorded in their medical notes. Twenty per cent of the school aged group had behavioural problems and 40% speech difficulties. Behaviour and speech problems were recorded if the parents or a health professional felt the child had problems in these areas. 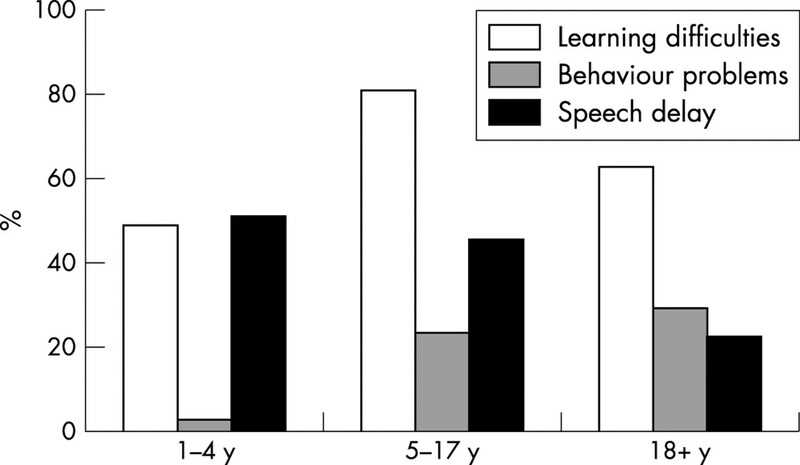 Incidence of learning difficulties, speech delay, and behaviour problems over the different diagnostic age groups. This study shows school aged children with a chromosome 22q11 microdeletion are less likely to be fully investigated than those presenting in infancy. Regardless of age at diagnosis investigations continue to have a high yield of abnormal results. The educational findings underline the wide ranging morbidity associated with this condition. Since case ascertainment was based on regional genetic laboratory findings, the study population represents children from the south and west of Britain with a chromosome 22q11 microdeletion identified during the period of investigation. The children were diagnosed in a wide range of settings throughout the region. It therefore appears likely that our findings are generalisable across the UK. We were unable to generate longitudinal data, which would have been useful to better describe the natural history of the condition. Echocardiography remains the most performed investigation, with a high prevalence of structural heart lesions detected at all ages. This is important, both to guide surgical interventions and to make antibiotic prophylaxis recommendations. The detection of hypocalcaemia is important as correction is likely to reduce the risk of seizures. Structural renal anomalies are known to predispose to urinary tract infections and are therefore also important to detect. Two patients in the European Collaborative Study were reported to have major immunological deficiencies.1 One third of those with recurrent infections in this study showed functional abnormalities of their lymphocytes. These more minor immune problems and recurrent infections may contribute to failure to thrive and school absence. Seventeen per cent of deletions were inherited. The detection of inherited deletions allows parents or other family members to make fully informed reproductive decisions. A clinical geneticist would be the appropriate person to counsel a couple regarding their options and to discuss the wider family implications of having a child affected with a chromosome 22q11 microdeletion. The phenotype of this condition is very wide, and recommendations based on the study findings are only intended to cover the more common features. As always doctors must use their clinical judgement to decide which tests are relevant and which additional investigations may be pertinent to each individual case. We conclude that each child, regardless of age, should have an echocardiogram, renal ultrasound scan, lymphocyte count and function, and screening for hypocalaemia, and that their parents have their karyotype checked. Each family should be offered a review by a clinical geneticist. Affected children should be under regular medical review from a community paediatrician or general paediatrican who would be best placed to monitor developmental and behavioural aspects of this condition and to coordinate the wide ranging medical care that these patients need. Chromosome 22q11 microdeletion is a multisystem disorder requiring a multidisciplinary approach to management. Ryan AK, Goodship JA, Wilson DI, et al. Spectrum of clinical features associated with interstitial chromosome 22q11 deletions: a European collaborative study. J Med Genet1997;34:798–804.